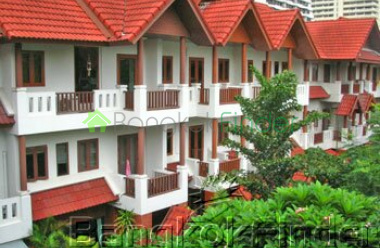 Large House for Sale Ladprao 4 bedroom This very large 300 square meter 4 bedroom unit can be rented and is for sale. The building was built in 2010 so its super new and clean. Its near the BTS Asok Station and near Subway at Sukhumvit Station The Terminal 21 shopping center, Foodland, Emporium, Benjakit Park, the National Convention Center. 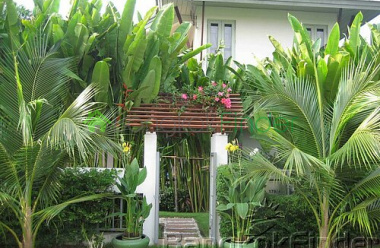 Bangkok Houses for Sale Ram Intra This three bedroom 250 square wah property can be rented or is for sale. As far as houses for sale goes this is the creame of the crop. The vegetation and tropical garden is very nice. If you are into quiet relaxation in a green and private environment, this place is for you. With 250 square metres of indoor living area you have loads of space. Bangkok Houses for Sale Ramkhamhaeng 3 bedrooms Large three bedroom house with study, spacious living room and water feature just 15 minutes to Suvarnabhumi airport, and near Ruamrudee International School and The Ascott. Asking price is extremely reasonable for a property in this prestigious neighbourhood and this is a very elegant home on the south side of town. 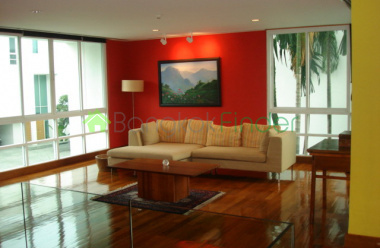 Bangkok Houses for Sale Sathorn 2 bedrooms These are beautiful town houses for sale in Sathorn Bangkok. This one is a multi-level three bedroom unit covering 338.30 square metres of living area. This one has four bathrooms. There are 25 town houses in this area and due to the excellent layout, privacy is ensured with a pool and wonderful courtyard. Bangkok Houses for sale Bangna area with garage Newly renovated detached house in a secure compound at Srinakarin, convenient to many international schools, the airport, and an easy commute into the center of Bangkok.The 2 bedroom house for sale, living area is 220 square meters with a garage. 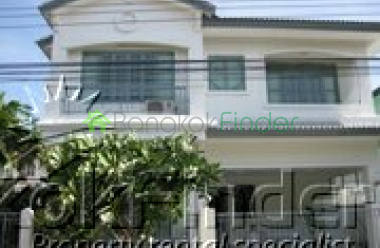 4 bedroom Bangkok Houses for Sale Srinakarin This is a 4 bedroom, 4 bathroom single Home covering 153 square meters of living space in the Bangna-Srinakarin Area - Thats close to the Suvarnabhumi Airport. Its a complex of homes which have 24 Hour Security, a private pool a very nice Clubhouse. Luxury and privacy are the hall mark including its own private garden. 5 Bedroom 700 sqm House for Sale Bangna Sukhumvit Great area with 24 hour security,safe many international schools-Ascott , Pattana and others. There is a pool on the premises with fitness area. 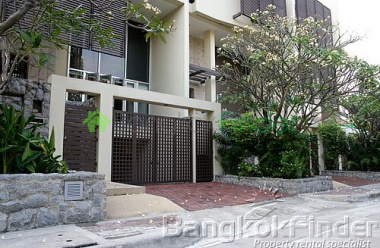 It also quite near the Suvarnabhimi airport easy expressway access.This is a private gated community.There is a nice outside garden. 4 bedrooms 340 sqm condo sale Phrom Phong Well established in the community town House for Sale including four bedrooms covering 340 square metres of space! Specifically located in the Sukhumvit-Phrom Phong area not too far from the BTS - Great for families and kids. This town home is selling at a very competitive asking price. 4 bedroom House for sale Sukhumvit 103 This is gorgeous well priced home in a villa located near Sukhumvit 103, very private and secure. It has 24 hour security in the complex. Nice garden and wonderful kitchen. A common pool shared with others in the villa. Think of the possibilities for barbecue's out doors and entertaining many of your guest in villa style luxury. 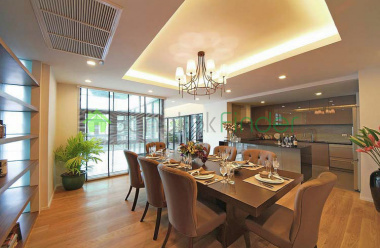 Huge 3 bedroom House for sale Chidlom Bangkok Talk about luxury and a lot of living space this place has it all. In Chidlom area of Bangkok upscale neighborhood with the embassies nearby this is suitable for a large family or executive retreat. 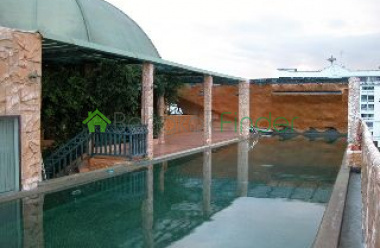 A massive 460 square meters of living space , 3 bedrooms , 4 bathrooms and its own pool. There is a waterfall which is rare and unusual on the property. Chaeng Wattana house 240 sqm Sale Bangkok This is a fantastic house-villa for sale with easy commute to Bangkok city centre via the expressway. It has wonderful design large at 240 square metres. A nice outside garden area enclosed for family barbecues. It has three large bedrooms and large kitchen with separate dining area. Private parking car-port for two cars. Plenty of storage and privacy. 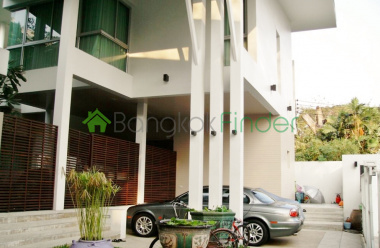 6 Bedrooms Bangkok House for Sale Sathorn This is a wonderful compound, a lowrise Near Sathorn Road and there are very nice houses in this complex. Each with a different design, good security, and this one has six bedrooms! It also has four bathrooms and its own elevator. A great courtyard for allowing the children a private play area. This is a fantastically large house ready to purchase. Stunning detached house in a secure gated community in a close by suburb on On-Nut road.The property is fully furnished throughout, and includes a western kitchen and also an eastern kitchen along with seperate maids room.The gardens are extensive, especially when considering the house's proximity to the city, and it even features a private swimming pool. 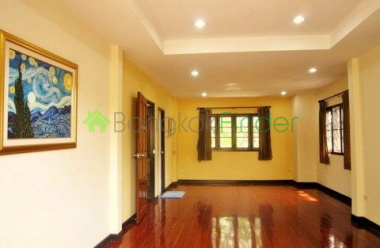 Beautiful detached houses in a compound at Udom Suk, a great location for commuting to the international schools around Bang Na, or into the city or the airport.having a gross internal area of approximately 692 sq.m. 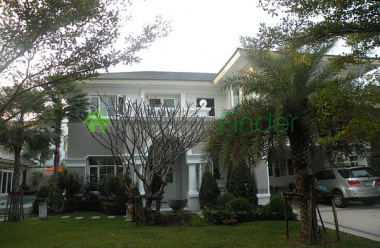 5 bedrooms,8 bathrooms,next to Suan Luang Rama IX, Chalermprakiat Rama IX ,Pravett,Bangkok. 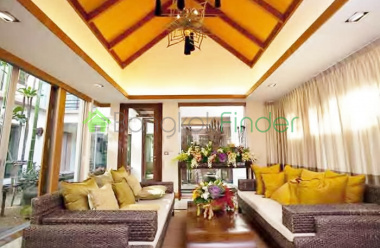 Private Pool Houses for sale Thonglor This a beauty of a property located in Thonglor area of Sukhumvit road. It has its own private pool , private garden area with a lot of green luxury. This is one of a 2 house complex which both have ceiling to floor luxury, 4 bedrooms 5 bathrooms. 5 bedroom house for sale Sukhumvit On Nut Perfect family house on Soi 101 upper On Nut just off Sukhumvit. This is a large living space suitable for a family looking for a home. The area is private and has five bedrooms, a garden area and is very secure. The total living area is 300 square meters, plenty of room to spread out, while one room could be a study or office. 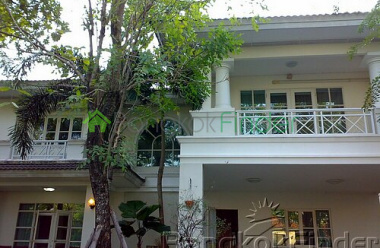 Bangna-Srinakarin House for sale five Bedrooms Breathtaking describes this Bangna-Srinakarin House for sale because of its layout and size. Composed of five large bedrooms with private living rooms and bathrooms for each, along with a family room, living room, dinning room, private library, home theater and private gym. 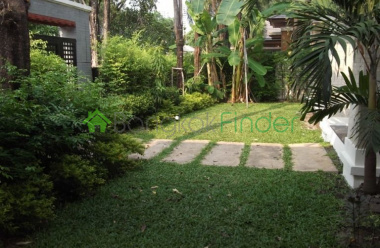 4 bedroom 330 sqm house for sale Bangna This house is less than 20 minutes to new airport, private and secure. Nice garden area outside and great design and feel of the property. Tesco and Big C food shopping nearby as is the Carfor. There is also a Tennis court, Fitness room, Swimming pool, Playground and security guards 24 hours. 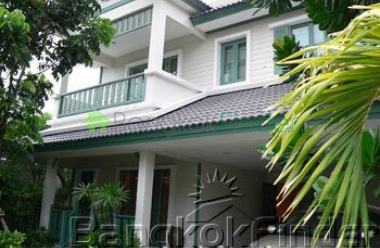 Large 400 sqm House for Sale PattanakarnThis is the perfect place for a large family, children and pets or a corporate retreat. 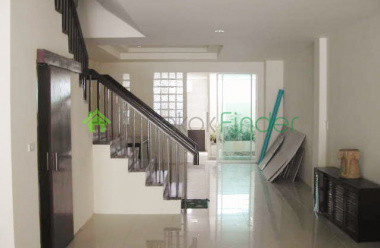 The 400 square meters is a lot of living space for four bedrooms and a study which could be converted to a 5th bedroom for grandma or guest.There is a nice garden, in the very exclusive compound with easy access to the expressway. It is only 15 minutes to the city. House for sale Ramkhamhaeng 288 sqm This beauty is very large and spacious with a tidy 288 square metres of living space. A green, green, green outdoor area. Privacy is complete with a tall security wall and long drive-way to the villa like complex. This is luxury living at its best. Moo Ban Park Avenue house for sale in Bangna This is a fantastic family home in a secure gated community offering a very spacious living area with a garden and yard adding to the sense of space and freedom away from the city pressures, and forming part of a tight knit neighbourhood where the kids have space to play and you are not at all removed from the best the city has to offer. House for sale Ramintra 72 sqw 3 bedrooms This is modern house, beautifully maintained and with immaculate wooden flooring and features throughout and together with the yard and garden covering a massive 72 square wah, meaning more than enough room for you and the kids to spread out and make the most of this great sense of freedom and escape. 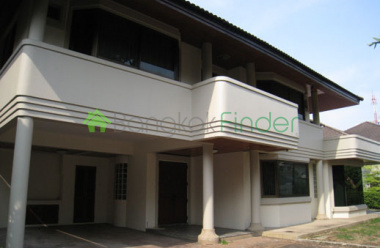 3 bedrooms 508 sqm house for sale Ladprao A huge house and property in a very exclusive gated community in a safe and secure neighbourhood strategically-placed for access to the airports, nearby provinces, international schools and the downtown CBD. Easy access by road or by MRT and a tremendous haven for the busy family away from it all, but with all the conveniences of modern luxury living. 3 bedrooms 240 sqm Natural Place house for sale Phrom Phong This is a fantastic house on four huge floors covering a very generous 240 sqm and in a self-contained community with a village ambience and peace and quiet guaranteed by the clever architecture and solid construction.